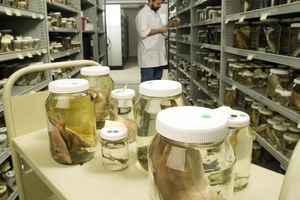 Alastair Graham, Fish Collection Manager, Australian National Fish Collection, examining a specimen in one of the 15,000 or so jars that are stored in the collection. The ANFC, formerly known as the ‘ISR Munro Ichthyological Collection’, houses approximately 150 000 specimens of almost 3000 species from Australasia, Asia, Antarctic, and the sub-Antarctic Islands. It is among Australia’s most diverse ichthyological collections and contains one of the largest collections of sharks, rays and deepwater fishes in the Southern Hemisphere. As well as large radiographic and frozen tissue collections, it houses the largest collection of photographs of deepwater Indo-Pacific fishes in existence. The Fish Collection group’s research is focused on biodiversity and biogeography of Australian and Indo-Pacific fishes. The group has strong research links to multiple international teams investigating the systematics of Indo-Pacific fishes.